Get set for a seriously magical Christmas with Snowflake Elf. All decked out in a cosy cream coat and matching pompom hat, this rosy-cheeked pixie is ready for sledging! With big foldy ears, shiny gold boots and mittens, shimmery buttons and stripey cream-and-gold socks, this tubby elf is full of enchantment. 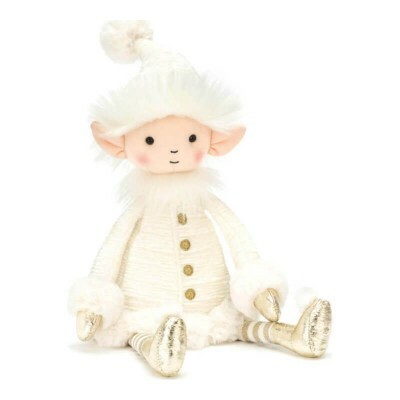 Snowflake Elf is safe for ages 12 months and upwards and measures 36cm tall. Made with 100% polyester.